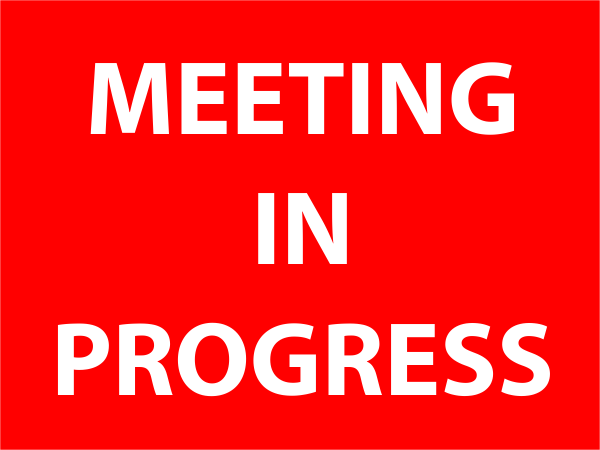 Hang this Meeting in Progress Sign to keep intruders out while you are conducting important meetings with that next client or investor. Choice of engraving colors. - Size: 6" x 8"
Engraved Sign Vertical 20" x 1"
Custom No Firearms Aluminum Sign | 18" x 12"
Metal Recycle Decal | 3" x 10"
No Exit Vinyl Decal Red Stripes - 6" x 12"
Add this Meeting in Progress sign to your office door to tell others that you do not want to be disturbed. Perfect for training & to take to conferences when you need the privacy. This 6" x 8" engraved plastic sign is weather-proof for indoor or outdoor use. Most orders ship the next business office from our Jacksonville facility.